Though he had fled Missouri over a week earlier, 150 years ago today (November 8, 1864) Major-General Sterling Price was still on the move trying to escape pursuit. After the failed attempt at Fayetteville on November 3, what was left of Price’s army marched southwest through the Indian Territories to avoid the Federals operating out of Fort Smith and gain a safe crossing of the Arkansas River. On November 4th, the Confederates reached the Sallisaw River, which they followed down to the Arkansas. Most of the battered Army of Missouri crossed the Arkansas on November 6th. 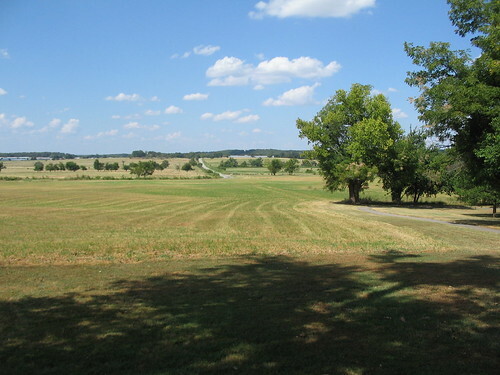 By November 5, Curtis reached Prairie Grove. Then on the 6th, he reached the Sallisaw River. The following day, fully expecting to engage Price, Curtis arrayed for battle. November 7 we started at daylight, our route leading through the woods and on by-roads in a southwesterly direction. Horses, wagons, and property stolen from the Missouri marked the way, which we followed till late at night and remained until the morning. Among other articles a carriage, said to be the one occupied by Price himself, was passed on the wayside, and everything showed a hasty and terrified retreat. Our curiosity, usual on such occasions, hurried the advance forward, hoping to overtake the enemy. About dark we came upon a cannon which he left in the road, and after a few miles more, darkness and a necessity to close up my forces induced another halt. We had very little chance to feed ourselves or horses and resumed the march early on the 8th, uncertain of our whereabouts, but confident of the enemy’s near presence as the prairie was still burning and his broken down mules, horses, and baggage were again broadcast over his well-defined way. Colonel Harrison now had the advance and pushed forward with great vigor to the timber, far in our advance, which proved to be the timber skirting the Arkansas River. A few of the rebel rear guard were driven beyond the stream, and bringing up McLain’s battery, we shelled the timber on the south side. Some of our troops crossed over and exchanged a few shots as they supposed with the last of Price’s army. Our work was accomplished, and the shout that went up from the Army of the Border and the roar of our cannon resounded through the gloomy forests of the Arkansas, carrying to the camp of the starving enemy beyond our parting farewell. This crossing, selected by Stand Watie’s Indians, is a little above the mouth of the Sallisaw, about twenty-five miles above Fort Smith. With that, the pursuit of Price came to an end. That evening Curtis issued an order proclaiming “the object of this organization and campaign is accomplished.” After congratulating the men on their performance, Curtis gave orders for the various parts of the pursuing force to return to their assigned stations. The Army of the Border had pursued Price for around 850 miles. They’d reached their assigned limit. At that point, what was left of Price’s command was, though free to move, so far out of position as to not threaten Missouri again. The Confederate Army of Missouri would spend the next thirty days marching through Indian Territory and Texas in order to get back to their base in southwest Arkansas. The last chapter in Price’s 1864 campaign was one of routine marches, recuperation, and attempts to justify the effort expended. After stunning losses at Westport and during the retreat through Kansas, Major-General Sterling Price’s Army of Missouri was defeated and broken. But it was not yet beaten. An army with arms is at least an army in being. Though delivering telling blows, the Federal pursuit failed to seal the deal and complete the defeat with capture of Price and his men. Following the disasters of October 25, 1864, Price continued his retreat through southwest Missouri. 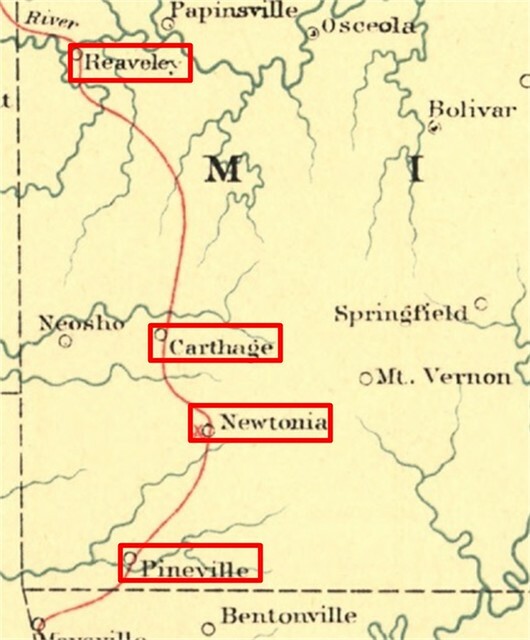 The column moved through Carthage, Granby, and went into camp about four miles south of Newtonia on October 28. Being convinced of their intention to avoid a fight, if possible, I determined to attack them at once. The First and Fourth Brigades were with me in the advance. I had directed the Second Brigade to halt early in the day to procure forage for their horses to enable me to put them in the advance to press the pursuit at night; consequently I did not rely upon them to participate in the early part of the engagement. I had supposed that General McNeil’s brigade, of General Pleasonton’s division, was close up in my rear, and sent back to hurry it forward, while the First and Fourth Brigades of the First Division were quickly deployed in line, and under the cover of the fire of the First Colorado Battery, posted upon the bluff, they swept across the plain at a gallop until within musket range of the enemy’s line. Skirmishers were rapidly deployed, and but a few moments elapsed until the engagement became general. I now ordered forward the First Colorado Battery, which, with a section of howitzers attached to the Fifteenth Kansas Cavalry, and under command of Sergeant Patterson, of the Fourteenth Kansas Cavalry, poured a destructive fire into the enemy’s ranks. We had scarcely commenced the ordinary duties of camp when we were again ordered out, and proceeding to the same place found the enemy drawn up before us on the opposite side of the small field. The firing commenced immediately, and in a few minutes our line bravely crossed the fence and advanced upon the enemy, crossing the field under a hot fire of artillery and small-arms, and drove the enemy into the open prairie. Not stopping at this second fence an instant, we advanced into the prairie and continued to drive the enemy, never letting them form to charge, which they endeavored to do. There was some mounted men on our right, but no supports near our rear, and I halted the line after we had advanced so far that we were exposed to flanking. We remained in this position until the enemy had retired their line, when we fell back toward our camp, receiving several shots from the enemy’s artillery as we retired. It soon became evident that I was engaging all the available force of Price’s army, which outnumbered me more than eight to one. Their superiority of numbers enabling them to press upon my flanks with a large force compelled me to fall back about 500 yards from my first line, which was done in good order, and the line reformed in the face of a terrific fire. 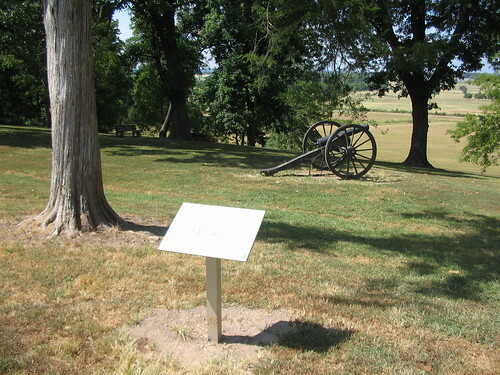 The enemy pressed forward their center, but were promptly checked by the canister from the First Colorado Battery. 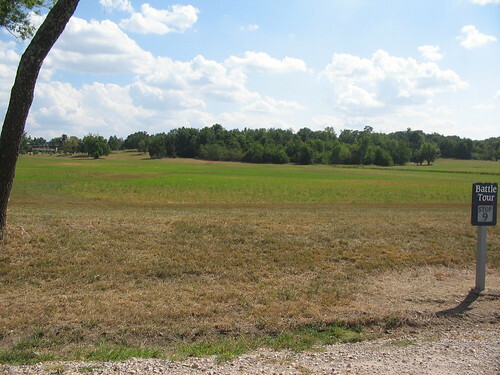 It was now near sundown, and my command had been engaged near two hours and their ammunition nearly exhausted, while a large force of the enemy were passing under cover of a corn-field around my left flank, and my force being too small to extend my line in that direction, I was about to direct my line to fall back and take position on the bluff, when very unexpectedly the brigade of General Sanborn, of General Pleasonton’s command, came up. I immediately placed them in position on my left, directing General Sanborn to dismount his men and advance through the corn-field, which was promptly executed, repulsing the flanking column of the enemy, who now abandoned the field and retreated rapidly under cover of the night in the direction of Pineville, leaving their dead and wounded in our hands. Blunt had about 400 casualties in the afternoon fighting – he estimated one-eighth of the force committed. Confederate casualties were just over half that number. 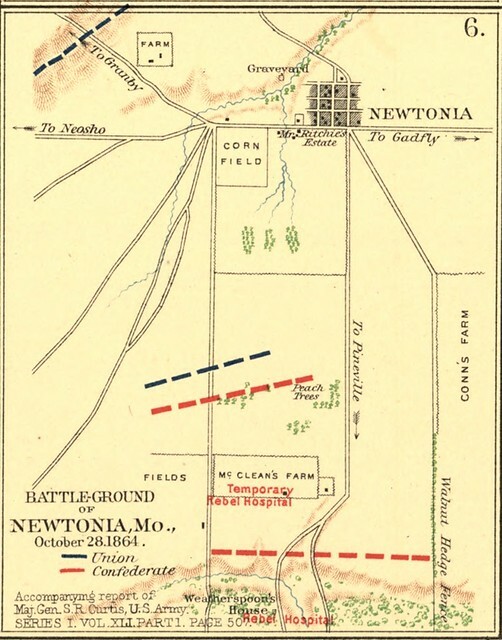 The short, sharp action at Newtonia was the last important action between Price and his pursuers in Missouri. The battle, though small, allowed Price more maneuver room to continue retreat. The next day, the Confederates passed through Pineville and then camped five miles to the south that evening. Price retreated out of Missouri, but his pursers had failed to destroy his army. Due to a split command, the Federals had allowed Price to slip through to Arkansas. The campaign was far from over, but the results were already clear for all to see. Missouri was a “battleground state” in the 1864 campaign season. And battles had secured the state for the union – both on the map and for the electoral process. 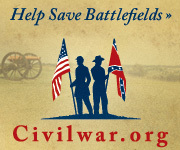 The Confederates, while still a force in being, were never again in position to threaten the state. But with a “Army in being,” Price was still a chess piece on the board. The pursuit, though not with an intensity of the late days of October, would continue to dog Price through Arkansas. 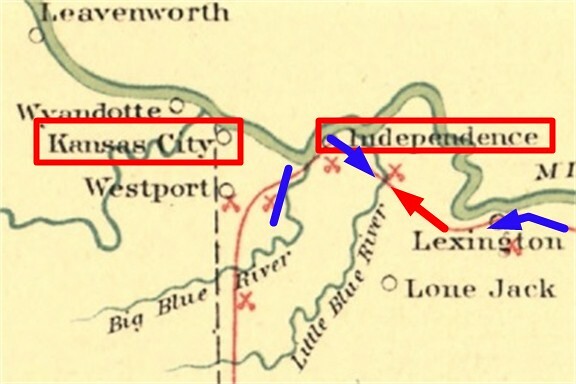 On October 22, 1864, as Major-General Sterling Price’s Army of Missouri continued its march westward, skirting Kansas City, the next major obstacle to cross was the Big Blue River. Minding his wagon train, Price needed a good ford over that river. The best option for him was Byram’s Ford along the Independence-Westport Road. The view above looks from the west bank, where federal troops defended on October 22, towards the east, from which Brigadier-General Joseph Shelby’s division attack. Just a small patch of woods in the midst of the Kansas City sprawl today (and not exactly in the most picturesque section either!). But in October 1864, that crossing point became – say like Beverly’s Ford in Virginia (and you’ll pick up on why I selected that later) – very important to the passing armies. 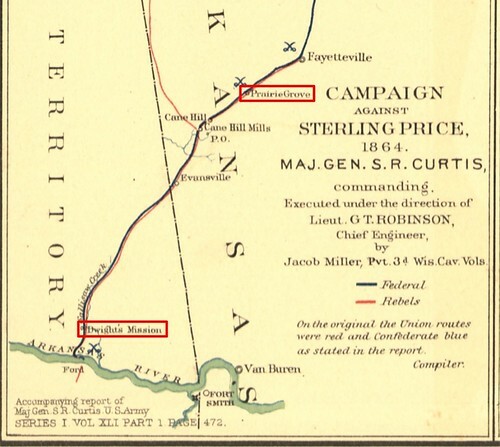 Major-General Samuel Curtis deployed his forces to cover most of the upper crossing points along the Big Blue River by morning of October 22. When Shelby’s men arrived around 10 a.m. on October 22, they made a frontal demonstration at Byram’s Ford. That was a distraction which allowed troops to cross elsewhere and flank the Federal position here. With their position turned, around 3 p.m., Curtis’ command fell back towards Kansas City. Shelby’s men captured “one beautiful 24-pounder howitzer” and several hundred Federals. By opening the crossing, Shelby allowed Price some maneuver space. The Confederate wagons soon turned southwest towards Little Santa Fe (bottom edge of the map above) and the Kansas border. 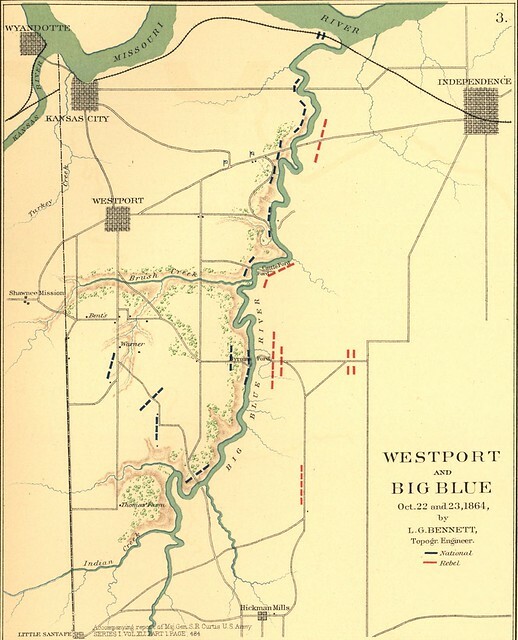 The fighting at Byram’s Ford, or Big Blue River if you prefer, was the “setup” for the larger battle outside Westport on October 23. In that light, we might look to what was happening behind the fighting to the east to the other movements that set in motion the events of the 23rd … specifically Major-General Alfred Pleasonton. The general dispatched you at 9.30 last evening that he was satisfied Price would move south, and that he had directed General Smith to move in direction of Pleasant Hill, and you to send three brigades in same direction; since which your dispatch of 11 p.m. was received this a.m., indicating that most of your command was too far advanced on the Independence road to move as indicated. He therefore leaves to your discretion the route of pursuit, satisfied, however, that Price moved last night, if not before, in a southerly direction…. I have just arrived at this point and find the bridge over the creek destroyed. I am building a temporary bridge over the creek to cross my command. The advance is on the other side of the creek; is skirmishing slightly with the rear guard of the enemy. I shall press forward as rapidly as possible. The indications are that the enemy’s whole force passed on this road except about one brigade, which went on the Lone Jack road. All the citizens say the enemy’s train passed here. Your dispatch 6 a.m. received. Curtis telegraphs me he makes his stand on the Big Blue. I have no doubt but that the enemy will turn south into Kansas, following up the Big Blue. Not knowing precisely where your cavalry may be I cannot direct your movements. I have no doubt if you can you should move on enemy’s left flank, but you must use you’re best judgment. Around mid-day, and likely not in receipt of the 9:45 a.m. orders, Pleasonton provided another update. He had made contact with Bunt’s forces out of Kansas City. Pleasonton’s forces were pressing the Confederate rear guard out of Independence (and though he didn’t recognize it, had temporarily cut off a sizable portion of Price’s command). By evening, Pleasonton was crowding the Confederates near Byram’s Ford. In short, he’d done what he DID NOT do at Brandy Station – move forward to command the situation. Your dispatches of 12.45 and 1.45 p.m. received duly, as were the two preceding. You are so near Independence that I am sure Price will go out of Jackson County into Kansas to-night. General Smith will be at Chapel Hill and will to-morrow move to Pleasant Hill. You have doubtless exercised your best judgment, but I still think to have threatened at the Little Blue and to have moved south with the remainder of your command to the Independence and Warrensburg road would have been better. By placing you near the enemy’s line of retreat Price’s retreat would then have been a necessity and with the infantry south of you and always behind you you could have swung around in safety. As it is now you must be left to conform your movements to those of the enemy, having in view your supporting force of infantry as well as your union with Blunt’s forces and the position of your depot of supplies at Warrensburg….. I am led to believe that Price will have moved by to-morrow morning a.s far south as Hickman Mills, with the intention of going into Kansas and down into the Indian Territory to avoid Steele. He has not procured a remount in Missouri. More than half of his horses are worn down and jaded. He goes into a hostile country to him. Our united forces will, I think, be able very nearly to destroy him. Smith’s infantry is well on the way to Pleasant Hill to-night, and can beat Price’s cavalry moving. Set in now, strain every nerve, and bend every will to bring the raiders to grief. I go to Pleasant Hill to-morrow. 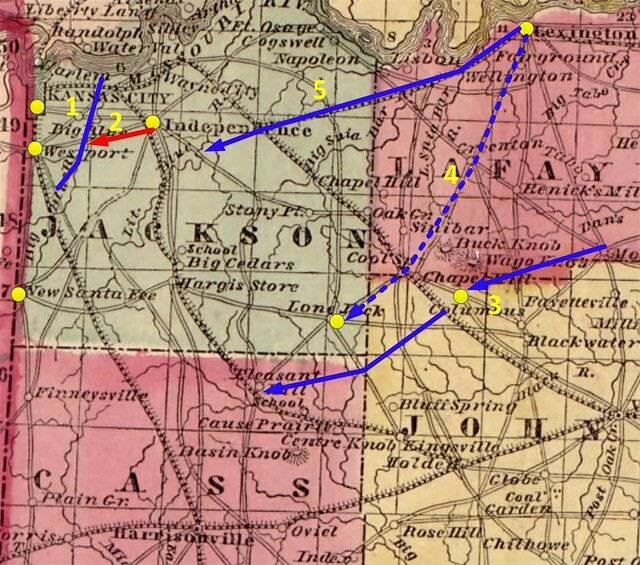 Curtis held a line along the Big Blue River (Number 1 on the map) and faced Price’s advance (Number 2). Able to force a crossing at Byram’s Ford, Price directed his trains south to New Santa Fe. 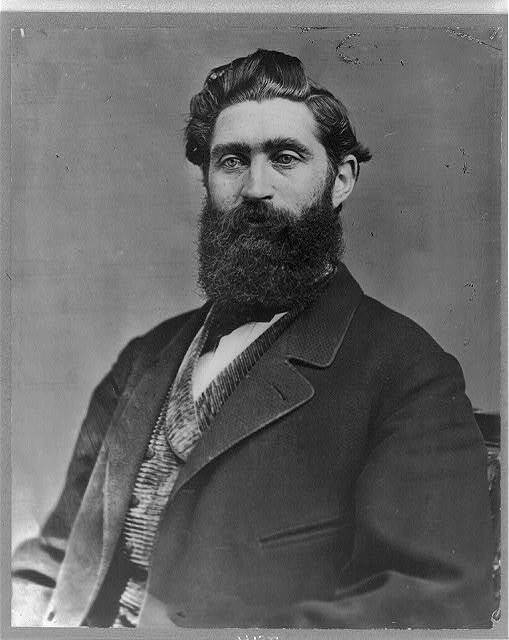 However to the east, Rosecrans had Major-General A.J. Smith’s column move towards Chapel Hill (Number 3), with the intent of moving forward to Pleasant Hill. Rosecrans wanted Pleasonton to move up on Smith’s flank to Lone Jack (Number 4, dashed line), but Pleasonton, operating with no small discretion, moved in direct pursuit of Price (Number 5). It’s hard to be fair to Rosecrans and not be critical of the plans he laid out that evening. Some have said, with merit, in his mind “Old Rosey” was still fighting at Chickamauga that fall. I would contend that October 22, 1864 was Alfred Pleasonton’s best day of the war. He put a cavalry force right where needed most, using his “best judgement” and somewhat in contradiction of his commander’s intent. Price now faced a strong force in his front and a cavalry force in his rear. As I write on October 21, 2014, Kansas City, Missouri has the attention of many Americans. Tonight the first game in this year’s World Series starts at Kauffman Stadium. One-hundred and fifty years ago, Kansas City also had it’s share of attention. On October 21, 1864, just fifteen miles (as the crow files) to the northeast of the stadium, an action along the Little Blue River, outside Independence, broke open a series of actions. Fighting would culminate two days later in one of the largest engagement fought west of the Mississippi River at a location roughly 10 miles southwest of the stadium. So can I say the return of the World Series to Kansas City is timely? I think so. An while Price neared the Kansas border, Federal forces confined him in both front and rear. Having fought a “developing” action at Lexington, Major-General James Blunt looked to delay Price at the Little Blue River. For this purpose, he left his second brigade, under Colonel Thomas Moonlight, consisting of Kansas cavalry, to contest the crossings there. Being thus menaced on all sides and the object for which I was left accomplished, the command slowly fell back about two miles, fighting. A favorable piece of ground here presenting itself, a new line of battle was formed on the left of the Independence road, and we slowly began to drive the enemy back over the ground again, dismounting every man for the purpose of shelter behind stone walls, fences, and houses, some of which were then held by the enemy, who, after a vigorous assault, were dislodged, thus affording us an advantage which accounts for the few killed and wounded on our side, compared with the enemy, who suffered terribly. The Eleventh Regiment here behaved like old veterans, and gave renewed proof of their fighting qualities, driving an enemy greatly their superior in numbers to the very ground occupied in the morning. By this time General Blunt had come up, and other troops were being thrown in on the right to my support. About 200 of the Sixteenth Kansas Volunteer Cavalry, under Lieutenant-Colonel [Samuel] Walker, of that regiment, reported to me and did splendid service on the left. Major [Robert] Hunt, Fifteenth Kansas Volunteer Cavalry, chief of artillery for Department of Kansas, reported about this time with some mountain howitzers, and rendered such service as only a brave and gallant officer can render. We thus held the enemy back for hours, a great portion of the time without any ammunition, supplying its place with lusty and defiant cheers. Don’t exhaust our troops, but fall back to this place with the least further effort. A small picket or two along the road, to let us have certain knowledge of the enemy’s approach, is all we need. Let Price have Independence. It is easily flanked, and his force, it is said, large. I have all day been fearing that he would send a whole division to get in our rear. Indeed, we have to fear a flank movement to-night, but here we have extensive lines fortified, and must save our resources of men and blood. I believe Price is retreating by Lone Jack and Chapel Hill. If this is so, while McNeil follows his rear the balance of the command should strike him near Lone Jack, following the Hopewell and Snibar road in two columns. The infantry can go by Renick Mills or follow the cavalry…. Clearly Rosecrans, commanding troops on the east in pursuit of Price, and Curtis, commanding those out of Kansas that were blocking Price, did not have a common picture of the battlespace. This variance was in part due to incomplete information, not so much held back, but not shared, between the commanders. Each had a different opinion as to how to track down Price. Pleasonton, however, was for all purposes standing in direct contact with Price’s trail elements. For him, option one was to follow Rosecrans’ intent and swing to the south to intercept Price – assuming Price was retreating south. Option two was to follow Price withdrawing westward. The situation called for Pleasonton to use his best judgment on October 22. September 19, 1864 was a busy day in the Civil War. Actions in several theaters, not the least of which occurred outside Middletown, Virginia (150th anniversary events I hope to attend today). Upon occupying Lexington I obtained reliable information that the advance of Price’s army, under Shelby, was at Waverly; that Price was calling in all detachments sent out for recruiting and other purposes and was concentrating his forces to meet an expected attack from the forces of General Rosecrans. On the 19th, at 11 a.m., while I was momentarily expecting the arrival of re-enforcements I had requested to be sent to join me at Lexington, and also to receive an answer to my dispatch to General Sanborn, a courier arrived with dispatches from the general commanding informing me that in consequence of the embarrassments thrown in his way by the Governor of Kansas and others relative to moving the militia out of the State, no re-enforcements could be sent to me. At the same time it was reported to me that my pickets were attacked and were being driven in by the enemy, who were advancing in force in three columns. 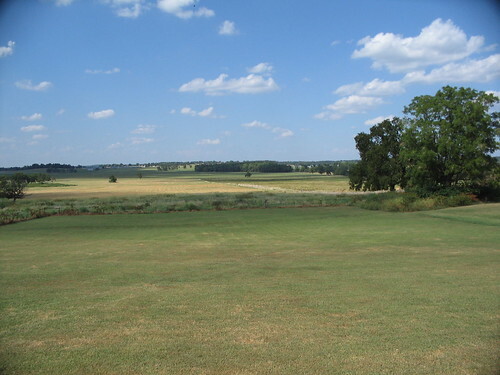 The pickets were re-enforced and instructed to resist the enemy’s advance, while the command was immediately put in position in line of battle southeast of the city, facing a section of open and undulating country, with cultivated fields extending from one to two miles in our front, with the Independence road in our rear, upon which I designed to fall back whenever it became necessary. As the enemy moved steadily up and massed his force in my front, I became well convinced that the whole of Price’s army was present, and with the small force of my command I determined not to bring on a general engagement, but to develop his force and movements and accomplish the object of a reconnaissance. All irregular firing upon the skirmish lines of the contending forces, with occasional artillery firing, was kept up for nearly two hours, when their long-range guns opened a brisk fire in my front, to which my short-range howitzers could not reply with effect, and being pressed by an overwhelming force, with an attempt to flank me on the right and left, I directed the command to withdraw and fall back on the Independence road. This movement was accomplished in good order, the Eleventh Kansas Cavalry, under the immediate command of Colonel Moonlight, covering the retreat in a gallant manner. The last position occupied by the rear guard with four mountain howitzers was held until dark and until the small command was almost entirely enveloped by the superior numbers of the enemy, when, under cover of the night, we moved by easy marches in the direction of Independence, having in the operation of the day punished our adversary severely, but what was of greater importance, developed his position, strength, and movements, the first instance in which it had been done since he had crossed the Arkansas River on his raid into Missouri. To his credit, Blunt’s work at Lexington did indeed delay Price’s advance. And worth noting, Blunt was able to establish positive communication with elements of moving west in pursuit of Price. Historians generally give Blunt credit for this action and cite it as a key event leading to the battle around Kansas City that would follow. But did Blunt accurately develop Price? Price advanced on Lexington in two columns and drove in my pickets about 2 p.m. I advanced my line skirmishing with them until their whole force was developed, and they commenced to flank me on the right and left, when I fell back on the Independence Road. They pressed us hard, but we made our retreat, losing but few men. I shall move unceasingly to-night until I find a good position and am in supporting distance of you. It is certain that Price’s whole force is in Lexington, and is not less than 20,000. Their artillery did us no damage, while ours was used with good effect. From a small boy of Shelby’s command, whom I have prisoner, I learn that Price brought about 20,000 men with him into the State, and has procured 5,000 recruits since. So the “development” was derived, in part, from the word of a boy. Blunt went on to say that if all moved rapidly, the two converging armies could catch Price. On the other hand, Blunt felt, “unless Rosecrans attacks him vigorously in the rear” that Price would escape through Kansas. 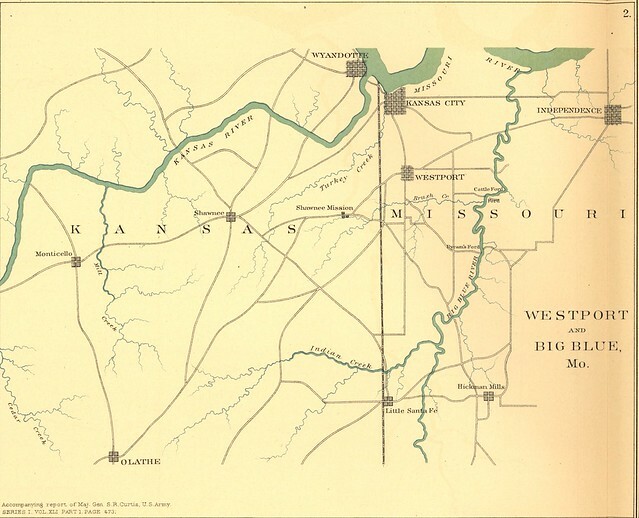 The largest major campaign of the war – in terms of distance covered – was about to turn upon the largest battle fought in the state of Missouri. But that was days away.